The tweets were posted on Friday on the company’s verified account, which has more than 700,000 followers. Last year, McDonald’s had one of its Twitter accounts hacked with posts attacking US President Donald Trump. 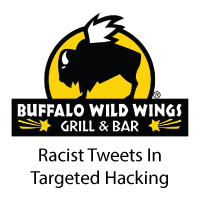 In the latest incident, Buffalo Wild Wings confirmed that its account had been compromised and that it had deleted the tweets after about 20 minutes. The company said in a statement that it was “in touch with our Twitter representatives and will pursue the appropriate action against the individuals involved”. The posts that briefly appeared on the account’s timeline included several that mentioned the N-word, a crude comment about a “secret recipe” ingredient at the restaurant and an offensive swipe at popular US food chain Wendy’s. There was also a tweet that referenced the disappearance of Madeleine McCann, the British toddler who went missing while on a family holiday in Portugal in 2007. 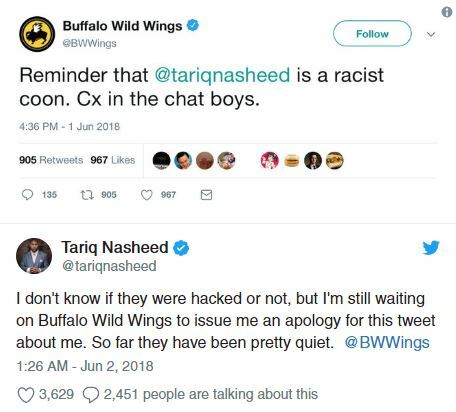 The author and filmmaker Tariq Nasheed, who was targeted in the posts, tweeted soon after they were published that he was “waiting on Buffalo Wild Wings” to issue an apology. He later welcomed the company’s apology after it verified that it had been hacked. Buffalo Wild Wings is a restaurant and sports bar chain best known for its chicken wings, which it serves with a variety of sauces. Some of its restaurants have been designed to give its clients, who the company refers to as “fans”, the experience or impression of actually being in a sports stadium. In March 2017, McDonald’s was forced to apologise after it said its Twitter account had been “compromised” with an insulting tweet aimed at Mr Trump. The post also asserted that Mr Trump had “tiny hands”.